FM Beacon Transmitter 88 108 MHz - This circuit will transmit a continuous audio tone on the FM broadcast band (88-108 MHz) which could used for remote control or security purposes. Circuit draws about30 mA from a 6-9 volt battery and can be received to about100 yards. FM Microphone - A micro-transmitter is so small and sensitive, it have only 8 easy-to-get parts and can be assembled in one hour�. FM Radio Transmitter (David Sayles) - This small transmitter uses a Hartley type oscillator. Normally the capacitor in the tank circuit would connect at the base of the transistor, but at VHF the base emitter capacitance of the transistor acts as a short circuit, so in effect, it still is. 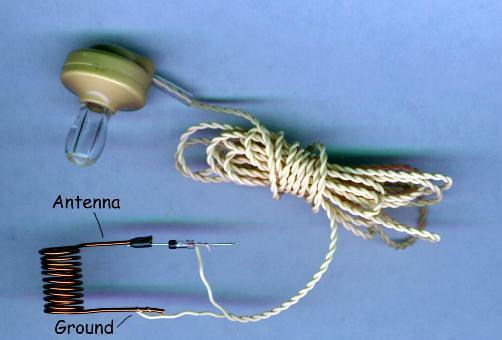 The coil is four turns of 18swg wire wound around a quarter inch former. The aerial tap is about one and a half turns from the supply end. Audio sensitivity is very good when used with an ECM type microphone insert. FM Receiver Using MPF102 - An FM regenerative receiver using a single FET and one audio amplifier IC�.